Posted September 4th, 2015 & filed under News releases. ClimateLaunchpad has just announced the winners of Europe’s largest start-up competition with primary focus on solving climate change. Amsterdam, September 4th 2015 – DesertControl from Norway has been announced as the winner of this year’s ClimateLaunchpad competition, winning €10,000 and a place in the prestigious Climate-KIC Accelerator for their business case which is about transforming desert and dry, sandy soil into productive farmland. Two further teams have also been awarded cash prizes. The top 10 teams have also been rewarded a place on Accelerator programme to commercialise their ground-breaking cleantech business ideas. This year’s competition attracted a record number entrants, with over 700 cleantech entrepreneurs applying from across 28 countries. A total of 81 teams were shortlisted to enter the challenging ClimateLaunchpad programme to refine their business offering, including perfecting their business model, value proposition and pitch. 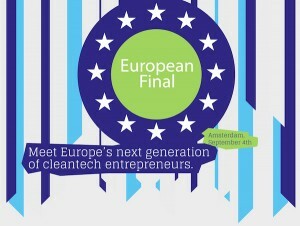 At the ClimateLaunchpad European Final in Amsterdam, each of these 81 teams pitched to a renowned jury that judged the entrepreneurs on real-world criteria including feasibility, scalability, job creation and climate impact. The three highly promising winners will now enter the Climate-KIC Accelerator, the world’s first 18-month business school for cleantech entrepreneurs to develop their innovations and fast-track their businesses. 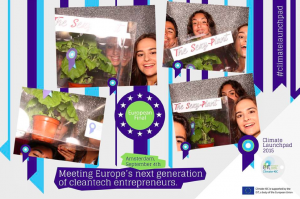 “The ClimateLaunchpad European Final was an amazing event, showcasing so many great business ideas, all with the potential to create new jobs and economic growth in Europe. Today, start-ups from all over Europe are sending a clear message to the COP21 negotiations in Paris: Invest in entrepreneurs if you want to tackle climate change. It is the single biggest business opportunity of the 21st century”. Click here for more detailed information on all finalists, whose business ideas span a broad range of sectors including energy, water, transportation and urban development.